Where does the world’s food grow? Developing countries are home to roughly 80 percent of the world’s population, 98 percent of humanity’s hungry people, and 78 percent of harvested croplands. Their farming systems have an essential role to play in addressing global food needs, ending extreme poverty, tackling climate change, protecting biodiversity, safeguarding water systems, and many other crucial challenges. But agriculture itself is a complex and vibrant sector, characterized by huge diversity. Therefore analysts and practitioners working on these big picture global issues can all benefit from a basic understanding of what the global distribution of crops actually looks like. To that end, we recently worked together on a paper, “What does ‘agriculture’ mean today? Assessing old questions with new evidence,” which provides a simple overview of crop types around the developing world. The analysis draws from Food and Agriculture Organization (FAO) data for crops harvested across 140 low- and middle-income countries. Full data tables are also available for download here. Figure 1 illustrates the extent to which, across developing countries, cereals account for the largest share of area harvested, often the majority. Indeed 59 countries have more than half their cropland harvested to cereals. In some developing regions the category accounts for nearly two-thirds of harvested areas, including 65 percent in Europe and Central Asia and 64 percent in the Middle East and North Africa. However, there is regional variation. Cereals account for only 34 percent of area harvested in Latin America and the Caribbean. In some countries with large agricultural land areas, such as Argentina and Brazil, oil crops like soy are more prominent. Different plants grow in different places. This is a key reason why patterns of technology diffusion in agriculture are distinct from those in other economic sectors. Figure 2 shows clear geographic patterns for cereal crops. Wheat grows best in temperate environments and is prevalent in parts of Europe and Central Asia, but almost entirely absent in sub-Saharan Africa. Paddy rice flourishes in lowland tropical environments, as are found in much of South and Southeast Asia. Maize can grow in both temperate and tropical areas, although its germinating properties are highly place-specific. It grows commonly in Central America and also Southern and Eastern Africa. In the Sahelian region of Africa, other cereals like millet and sorghum are most prominent. Summary: There is a deep connection between the end of the Cold War, the Yugoslav wars and the attacks in Brussels. They may appear separate but are deeply interconnected. The release of tensions between the United States and the Soviet Union triggered a seismic shift along the fault line of U.S. containment strategy that runs through the Middle East. These tremors are still playing out today. Radovan Karadžić, former president of Republika Srpska, a Serbian enclave in Bosnia, was found guilty of genocide by a United Nations tribunal yesterday. He was accused of the deaths of more than 8,000 Bosnian Muslims in the 1990s. The date of his conviction, March 24, is also the 17th anniversary of the beginning of the NATO bombing campaign in Serbia that led to separation and independence of Kosovo from Serbia. 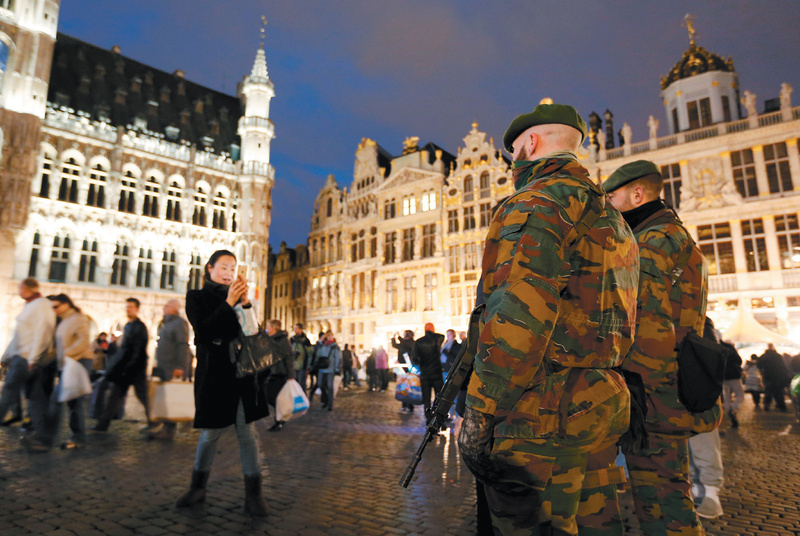 It is also the week in which members of the Islamic Statecarried out an assault on Brussels. The three events are intimately connected. The American strategy during the Cold War was to contain the Soviet Union. One part of the containment line ran through Europe. Another part, after the Sino-Soviet split, ran along the northern Chinese border. The third line ran from Yugoslavia to Afghanistan - through the Islamic world, with predominantly Muslim countries on each side of the line. The tremendous force of the Western alliance, China and the Soviet Union had frozen these boundaries into place. With the exception of Afghanistan later in the Cold War, this created a tense but coherent region. Various countries were in different alliances, and some in none, but on the whole the Cold War brought a relative stability to the region. The shifts that took place were managed by the great powers to limit their destabilizing effect along the line of confrontation. When the Soviet Union collapsed and the line disappeared, three things happened. In Europe,Western-style democracies emerged in the former Warsaw Pact countries. In China, the People's Liberation Army and the Communist Party shifted their focus to economic development. And the line from Yugoslavia to Afghanistan destabilized. It did not destabilize all at once, or even quickly. But as the force field between the U.S. and the Soviets disappeared, the region regained its autonomy and destabilized. Put another way, the Muslim world destabilized, and Muslims confronted the Christian world that had shaped their map. This began in Yugoslavia. Yugoslavia was a country invented after World War II, containing Muslims and Christians, with a wide range of bad memories about each other and therefore hostility. After World War II, Yugoslavia was frozen into place by two forces. One was the communist government of Josip Broz Tito, which submerged ethnic and religious difference under its government apparatus and security structure. The other force freezing Yugoslavia into place was the fact that, having come to power independent of the Soviets, Tito did not want to become a Soviet satellite. Therefore, Yugoslavia maintained a neutrality tilted mildly to the West. That stance froze Yugoslavia, as neither the U.S. nor the Soviets wanted to take the risk of shifting its orientation, and Tito did not want do anything to trigger a change in policy. When my friend Lothar Lutze urged me to soliloquise on my Tagore, the immediate reflex that circled in my mind was to reverse the sequence of such an undertaking and dwell simply on Tagore's Me. For one thing, here is a man who tends to mould the very design of my Dasein, the niche of my innermost being and becoming. There is here a sort of pre-ordained determinism at work. It has often occurred to me, whilest pondering on my behaviourial responses to certain phenomenal stimuli, that it is Rabindranath Tagore's characteristic way of confronting reality that has invariably affected mine. It has struck me with a kind of shudder in those junctures of time that he, in an all-encompassing manner has been integrating, if not devouring, my biography. Someone who does not know Tagore could call this a kind of impinging on Tagore's part, in view of the fact that although he composed a few autobiographical fragments, he never took this form really seriously in the context of Art, for he maintained that a true poem transcends its materials and aptly compared a poem to 'A dewdrop which is a perfect integrity that has no filial memory of its parentage'. Tagore's lingering distrust of the relevance of biographical details to any of his works could suffice to set the scene today here in Darmstadt, where 72 years ago, paradoxically, his legendary personality shone so luminously that his Art was totally lost sight of. Like many of the citizens of Darmstadt who were mesmerized during the Tagore-Woche 1921, I myself, in Bengal, also became vulnerable to the legend called Tagore in my childhood days at his Ashram, Santiniketan, and possibly considered his creative works rather secondary. Recently while reading Holger Pausch's Biographia Literaria of Paul Celan, a writer who, as a poet in and of exile, has loomed far larger in my life than Rabindranath Tagore, I chanced upon the author's laconic remark: Biografisches, Sekundares. Apparently, this condescension towards the biographical as something secondary bears some resemblance to Tagore's view-point. But while reading between the lines I found the author was doing this because most of the facts concerning Paul Celan's life are irretrievably lost and therefore he was inviting us to concentrate solely on his poetry, which reads like hieroglyphics. Not so with Goethe and Tagore. Almanacs such as With Goethe throughout the year are revised every now and then to record each moment of his illustrious life. Similarly, hundreds of bibliographic documentations on Tagore are now and again rushed into print so that we are bound to learn by heart every item about his life. In itself, this is no heinous crime. But something is deliberately mistaken here. Quite a lot of sublimising and stylising ingredients are concocted to project him as greater than he was. Long ago Keats has taught us that greatness as such has nothing to do with poetry. But Bengali Tagore-biographers have always irritated me in their painstaking mission to glorify the otherwise great man with overhead projections in order to minimise the greatness of his poetry. The Tagore euphoria, European or otherwise, has been aptly branded as 'Idolatrous' and 'Bardolatry' by Stephan Zweig and William Radice respectively. As a child I felt an easy prey to this kind of prismatic reception. As a boy of eight I caught glimpses of the mammoth mourning procession escorting Tagore's dead body from our south Calcutta flat, bitterly wept and felt obliged to register my elegiac reaction in a fragment of verse. The next morning I was put to shame when I saw that in most of the Bengali newspapers the funeral procession was depicted in flowing diction. I tore up my prosaic composition describing the death of a poet. That was 1941, the year when Rabindranath Tagore, James Joyce and Virginia Woolf passed away. Later on the other two names came to mean much to me and it was in an act of devotion to their geniuses that I dismissed the celestial hierarchy which gave Tagore a higher rank than the two others. But in those early days such an act would have been regarded as the worst possible sacrilege. In one sense I was lucky not to have experienced Tagore alive. For then I might have become completely immersed in him, bereft of all the contours of my own self, however small its dimension may be in relation to Tagore's. Ambani is taking a big gamble away in riskier and low-margin businesses in retail and telecom, both consumer facing businesses where success will not be easy. While the risk-taking spirit of the Ambanis is not in doubt, it is worth asking if a group as big as Reliance can really be nimble. The world over, being big is no longer a guarantee of success. Reliance should convert itself into a holding firm with investments in various businesses, with each one of them being separately listed. This is the Warren Buffett type of investing, with the promoter’s main job being capital allocation between competing businesses. In order to insulate itself from disruptive technologies, Reliance needs to become an investor in other start-ups so that it can buy into a future Whatsapp or Facebook or even a Micromax. Despite a rash of failures, small is the future of big business. It is not the humble cockroach that is extinct, but T-Rex. If a report by Bank of America Merrill Lynch is right, the launch of Reliance Jio’s 4G services nationally may get delayed to December 2016. The fact that the public has not got even one whiff of the final product as yet (Mukesh Ambani said the product was being intensively tested inside the Reliance Group last December) lends credence to the suspicion that the Jio product is yet to find its final form. At the Reliance annual general meeting in June 2015, Ambani said he was “glad to announce that the financial year 2016-17 will be the first full year of commercial operations for Jio.” Well, financial 2016-17 is just a week away, and we see no frenetic activity in opening up showrooms, purchase of advertising billboards, or anything suggestive of an early launch. The earlier expectation was that the service would at least be launched in a limited way by April. Meanwhile, Jio’s rivals have hit the ground running, with Airtel rolling out 4G services in 350 cities, and Vodafone and Idea hitting the road with ambitious launch plans recently. Has Reliance Jio goofed up on its second coming into telecom, after losing the first one to the group split, with brother Anil Ambani getting Reliance Communications? #1: As far back as 2010, Reliance bought all-India spectrum in the 2,300 Mhz band. It paid Rs 4,800 crore to buy 95 percent in Infotel Broadband, which itself had bid over Rs 12,848 crore for 22 circles. Since 2010, this spectrum has been lying idle -a phenomenal waste of such a huge investment. #3: Even in its first coming, when Ambani launched Reliance Infocomm (Anil Ambani changed the name to RCom after he got it as part of the asset division among the brothers), he had made the wrong call on technology. He chose the spectrum-efficient CDMA instead of the universal GSM. Anil Ambani had to opt for a dual-tech licence, and his growth has been in GSM. #4: In the process of diversifying away from its core oil-petroleum-petrochemicals-plastics business, Reliance has converted itself from a zero-net-debt company to a relatively debt-financed company. As at the end of December 2015, Reliance Industries had net debts of Rs 86,341 crore, with overall debts of Rs 1,78,077 crore being partly balanced a bit by cash and cash equivalent assets of Rs 91,736 crore. It is more than likely that much of this debt is due to Reliance Jio, where the company plans to spend nearly Rs 1,00,000 crore, with three-quarters of it already spent, an Economic Times report of July 2015 said. We have lost the battle for privacy – both to government and private parties. Big brothers will be watching over us now, and one can only hope our privacy will not be compromised to a level where it hurts us. On the brighter side, the big brother may occasionally protect us from the jihadi suicide-bombers. Whether we like it or not, citizens are steadily losing the battle for privacy. A brave Tim Cook, CEO of Apple, has said ‘no’ to the US Federal Bureau of Investigation’s request to take a peek at the encrypted iPhone used by a terrorist, Syed Farook, who killed 14 people in San Bernardino, California, and was himself killed in the shootout. The case will be argued in court, and will, surely be appealed repeatedly till it reaches a conclusion in the highest court. The chances are Apple will ultimately lose the appeal, especially when terrorism has shown no signs of abating. Even if it wins, it would have won a battle, not the war. The war is heading in the other direction. If Apple can’t win this war, India can’t either, but we must thank the NDA government for small mercies. Last week the government legislated the Aadhaar (Targeted Delivery of Financial and Other Subsidies, Benefits and Services) Bill 2016, which – for the first time – mandates a modicum of privacy for the data gathered by the Unique Identification Authority of India (UIDAI). Nearly a billion Indians – men, women and even children – have shared biometric data with the UIDAI. Under the new law, this data will not be shared with anyone, including the Aadhaar recipient, and only national security can be a reason for forcing UIDAI to share it with the law enforcement agencies, and that too after proper vetting by responsible officials. This is a darn sight better than what the UPA did, which simply pushed ahead with collecting private data without any legislation – effectively making the Aadhaar effort partly illegal. The NDA law at least gives Aadhaar a post facto legal basis for directing subsidies to the right beneficiaries. Given our scant respect for the law – any law – it is quite possible that in actual practice the privacy protections guaranteed by the legislation may be breached. If someone high up (say, a top cop, or someone in the PMO or the CMO) asks for data, the system may still oblige even without formal authorisations. Remember how the Radia tapes got leaked to the media? But overall it is clear that there is some legal protection for the privacy of citizens. The problem though emanates elsewhere, and the Apple case in the US illustrates this very well. In its fight with the FBI, Apple has only declined to share information stored on the terrorist’s iPhone (which is encrypted), but the company still provides anti-terror investigators lots of info on email, pictures, and other data stored on its iCloud servers. In other words, the fight is only about data stored in the iPhone device, not all the data Apple stores. This is like putting your finger in the dyke. Even though other tech giants – Google, Facebook, and Microsoft, who like to encrypt their services and devices - have weighed in on Apple’s side, the companies have effectively bartered away their data to police forces all over the world. Blackberry, which tried hard to restrict access in India and the rest of the world, ultimately caved in as pressure from governments has proved insurmountable. They have already compromised privacy to a large extent. Let us dispose of the notion that India does not carry out covert operations against Pakistan. New Delhi has, at least since 1990, refused to use the instrumentality of terrorism to hit back at Pakistan, but you can be sure that – short of terrorist acts – it employs all the weapons available in the covert arsenal for both defence and offence. This is the least you can expect, given Pakistan considers India its primary adversary and is into all kinds of activity ranging from ordinary espionage, to subversion of currency, promoting separatism and supporting terrorism. India has important strategic interests in Pakistan, including in the Balochistan region. Balochistan is of interest principally because of the stepped up naval activities of the Chinese in Gwadar and the plans for the China-Pakistan Economic Corridor. For the past two decades, India has made no secret of its activities in Iranian Balochistan. It has sought to develop the port of Chabahar for alternative routes to Afghanistan and Central Asia. It has used its consulate in Zahedan, which is near the Pakistan border, to keep an eye on Pakistani activity there and support Indian interests. All this is done, of course, under the watchful eyes of the Iranian authorities who, no doubt, have their red-lines on what the Indians can do and what they cannot. Looking at the case of Commander (retired) Kulbhushan Jadhav, the arrested India man that Pakistan says is a ‘RAW officer’, it is worthwhile recalling the legendary CIA counter-intelligence officer James Jesus Angleton’s description of intelligence craft as “a wilderness of mirrors.” Finding out where the truth lies is next to impossible, and reality is what you want to believe. At first sight, the facts of the case are fairly straightforward. On Thursday, local media in Pakistan reported that its security forces had arrested “a serving officer in the Indian navy and deputed to the intelligence agency Research & Analysis Wing (RAW)” in Balochistan. Subsequently, Dawn reported Balochistan home minister Mir Sarfaraz Bugti as saying that “an Indian spy” was arrested in the southern part of the province. NEW DELHI: During a press conference on March 4, Defence Minister Manohar Parrikar made a startling announcement, revealing he had discovered India was paying the US Department of Defence (DoD) for new weaponry, even though US$ 3 billion which had been earlier paid by MoD was piled up and lying forgotten in a Washington account. Despite Parrikar stating this at a press briefing, the issue curiously didn’t find mention in national dailies. MoD had reportedly put the said money in a Pentagon account for weaponry that was to be bought under the Foreign Military Sales (FMS) agreement. This is the shortest way of procuring weaponry from the US under which the DoD procures equipment on behalf of the foreign government from US vendors. The US opened up FMS sales to India in the immediate aftermath of the 9/11 terrorist attacks. It is unclear when the money was paid by MoD but if it was piling up in Washington, it obviously was paid over a period of years. US$ 3 billion is not a small amount considering that in rupees today it amounts to some Rs 20,100 crores. How could it be “forgotten” if FMS procurements are supposed to be in quick time? Isn’t it intriguing that such a large amount lying unspent and earning interest money for the US was not once pointed out by the Comptroller and Auditor General (CAG)? Of course if the CAG is a former Defence Secretary who himself was party to such stashing away of defence money in his former avatar, he obviously would remain mum. It certainly raises a stink that needs to be thoroughly investigated by the CBI. What military modernization could have been done with US$ 3 billion can be gauged from the fact that INS Vikrant, India’s indigenously built aircraft carrier launched in August 2013 was at a cost of US$ 7.7 billion. Parrikar referred to the lapse as “because of ill-management or lack of attention to this account”. Did this comment indicate a lid was to be put on the issue in the exuberance of this new find of forgotten billions? With reference to the above, the Press Information Bureau (PIB) has now come out with a statement which says MoD has fine-tuned FMS procedure with the US Government where all the bills have been pooled together in a corpus; so for contractual obligations the said amount is being withdrawn from the corpus - payment is being effected from the corpus of 2.3 billion US Dollars. The PIB release adds, “This has happened through scrupulous and holistic financial management. Consequently, while US government will continue to meet their contractual obligations, there will be no additional burden on Government of India on this account”. But under what regulations does MoD have the mandate of creating a corpus abroad to the tune of billions of dollars, especially when Parrikar clarified on March 4 that this $3 billion stash was not earning any interest for India. If , as the Defence Minister refers in an open forum, the lapse was “because of ill-management or lack of attention to this account”, without doubt it is ill-management because such an amount can’t simply be forgotten”. On the contrary this was most likely a willful act. It does seem that billions of dollars accumulated like this over years with the CAG not pointing out the lapse could have ulterior motives? What if it was “forgotten” for a few more years? The question also arises whether there are more such stashes abroad, a possibility which exists with CAGs failing to point this out even once. RIS — Nexter submitted on Feb. 15 its final bid in an Indian tender for a €1 billion ($1.1 billion) contract for 1,400 155mm towed cannons, Stéphane Mayer, chairman of the land armaments company, told a parliamentary committee. “We submitted our final offer Feb. 15,” Mayer told the National Assembly defense committee on March 2. The competition, worth €1 billion and the largest for land weapons, will yield “the contract of the century for artillery,” he said. Indian authorities have set final selection between the two bidders by the end of the year, to allow for exclusive negotiations, he said. Nexter has teamed with local partner Larsen & Toubro to pitch its Trajan 155mm/52 caliber gun against Elbit Systems, partnered with Bharat Forge. The French state-owned company is also pitching its Caesar 155mm/52 caliber cannon in a second Indian tender for 800 truck-mounted guns, with a bid due in 2018, Mayer said. That Indian project compares to 77 units delivered to the French Army. The Indian defense acquisition council approved in November 2014 a budget of $2.5 billion for 814 of truck-mounted artillery, dubbed mounted gun system. “Experience has shown in India, patience is very much needed in general, and in defense in particular, and the delays are not rare,” Mayer said. On the truck-mounted gun, Nexter has teamed with Larsen & Toubro and Ashok Leyland, with the latter for the truck chassis. For Qatar’s tender for 300 infantry fighting vehicles, Nexter has given demonstration trials with its véhicule blindé de combat et infanterie, with a heavier gun than the weapon fitted on the French Army VBCI, he said. Nexter and BAE Systems are partners on the 50-50 joint venture, CTA International, which builds the 40mm cased telescoped cannon. Nexter also has made pitches to Egypt, Mayer said, without further detail. The Middle East is a “consuming region” for defense equipment, he said. “That is a euphemism,” said Member of Parliament Charles de La Verpillière. Any order for the Army would follow Egypt’s recent moves on modernizing the Air Force and Navy, which are re-equipping with the Rafale fighter, a multimission frigate and four corvettes, with two more on option. In Europe, the land weapons company last year sold cannons worth some €100 million to BAE, and expects a British requirement in 2018 for 300 to 400 infantry fighting vehicles, Mayer said. Nexter has given a demonstration for Norway, which is looking to order artillery, while Denmark and Finland also seek new cannons. The company struck its first sale in Africa with a deal with Gabon, he said. Nexter said October 2014 it signed a contract for 12 Aravis four-wheel drive vehicles armed with a 20mm gun. On the difference in German and French arms export rules, the two governments are in talks on updating the 1972 Debré-Schmidt bilateral agreement on foreign sales, but that has been disappointing. “I have to say the intergovernmental discussions — necessarily long — have not so far led to amendments that meet our expectations,” Mayer said. Those changes are seen as key as Nexter has formed a 50-50 joint venture with Krauss-Maffei Wegmann, to share technology to build a future tank for France and Germany by 2030 and cooperate in the pursuit of foreign markets, he said. Is living in the dark North Korea's sacrifice for developing nuclear weapons, or does it demonstrate incapability? Geopolitics begins with maps and maps tell extraordinary stories. 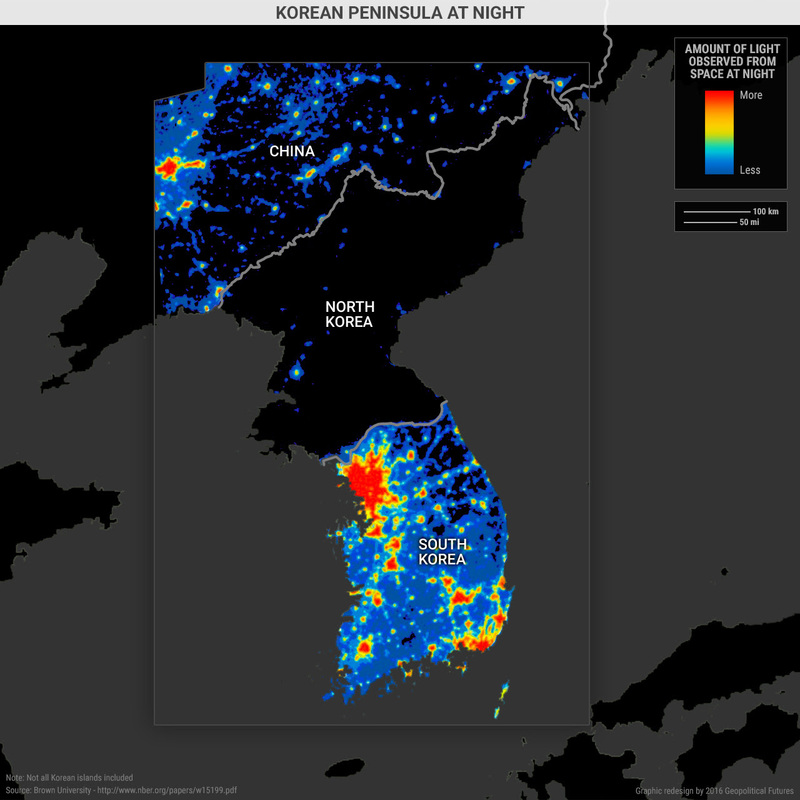 The map above is the Korean peninsula taken from space, showing ground illumination—lights. Notice the bright lights in South Korea, the sparser lighting in China. Then look at the darkness in North Korea. That map tells you more about the reality of North Korea than all the doctoral dissertations in the world. North Korea appears pre-electric. We have a nuclear power whose night is as dark as the Middle Ages. The Bering Strait bridge, connecting a mere 65 km separating the North American continent from Eurasia. The reality of the collapse of the entire western financial system is no more clearly expressed than in the discussion now dominating the leading banking circles across Europe and the US—to adopt "helicopter money" as the next stage of insanity in dealing with the bankruptcy of the system. An idea introduced by economic fascist Milton Friedman, and promoted by former Fed Chairman Ben Bernanke, helicopter money entails the central banks by-passing the banks altogether, and simply printing money for the governments, or even for businesses and private citizens. Insane? Of course—and those few leading bankers who have retained an ounce of sanity are admitting it. Otmar Issing, the former chief economist at the European Central Bank (whose current chief Mario Draghi announced this month that it will increase the QE printing of money for the banks from 60 to 80 billion euros every month, and reduce interest rates to negative!) today told the German Press Agency that this discussion was simply a declaration of bankruptcy. "I see the entire idea of helicopter money as worrisome, even devastating," Issing said. "For it is nothing else than a bankruptcy declaration of monetary policy.... A central bank that is throwing out money for free, will hardly be able to regain control of the printing-press.... I view that as a total mental disarray." Yet the American and European populations have been so beaten down and terrified that they tolerate this madness. As the American population is driven into massive drug addiction, demoralization and escalating numbers of suicides, people say, "Yes, but—I didn't cause that and there is nothing I can do." That is both false and cowardly. What can and must be done was demonstrated today in Frankfurt, Germany, where scientists and engineers and citizens from across Europe and Africa met with Schiller Institute founder Helga Zepp-LaRouche to discuss "Solving the Economic and Refugee Crises with the New Silk Road!" It was also demonstrated in Texas, where LaRouchePAC leader Kesha Rogers intervened in a demoralized meeting of NASA scientists who were resigned to living within Obama's collapsing NASA budget. Rogers revived their spirits by addressing the cause of the crisis in the collapse of the financial system, which can and must be replaced, and in Obama himself, who can and must be removed from office—now, not next year. It was even demonstrated in war-torn Yemen, where a friend of LaRouche released the recently translated Arabic version of the EIR Special Report The New Silk Road Becomes the World Land-Bridge, introduced enthusiastically by the former President of Sana'a University. Backing up this effort stand China and Russia. Secretary Kerry is in Moscow, where he is meeting with Foreign Minister Lavrov and President Putin, continuing to carry on real diplomacy outside of the control of the White House, to end the terrorist threat in Syria and beyond. In China, Premier Li Keqiang brought the leaders of the Mekong nations together to launch the Silk Road process along the Mekong—a policy promoted by Franklin Roosevelt in the 1930s, modeled on his TVA project, but which has been systematically sabotaged from any significant progress over these past 80 years under the influence of the World Bank and the Asian Development Bank. China will now sidestep that sabotage and help these national launch real development, as they are across the world. Americans and Europeans are beginning to recognize, although far too slowly, that the hysterical effort to present Russia and China as enemies, and that we must prepare for war, is both suicidal for the human race, and the opposite of the truth. China and Russia and the BRICS nations are offering a life-line of a scientific and cultural Renaissance to a dying culture in the West. Are we human enough to get on board? The seminar, "Solving the Economic and Refugee Crises with the New Silk Road!" organized by EIR in cooperation with the Consulate General of Ethiopia in Frankfurt, was attended by an audience of 75, consisting of representatives of several diplomatic offices, of subscribers and contacts of EIR in the region, and about 10 Syrians (students as well as refugees waiting for enrollment at universities). Several contacts even came from as far away as Berlin, and cities in Switzerland. Extending over the entire afternoon, the seminar featured presentations by Helga Zepp-LaRouche, chairwoman of the Schiller Institute; Hussein Askary, EIR Arabic Editor, Stockholm; Mehreteab Mulugeta Haile, Consul General Federal Democratic Republic of Ethiopia; Marcello Vichi, former Director, Foreign Department Bonifica company, author of the Transaqua concept; Andrea Mangano, Vice President, Italian Association of Water Engineers and contributor to the Transaqua outline. The speakers were joined by Mohammed Bila, Lake Chad Basin Commission, and Ulf Sandmark, Schiller Institute Stockholm and Swedish-Syrian Committee for Democracy, for an expanded panel in the second part of the seminar. The seminar was moderated by Claudio Celani of the EIR's European center in Wiesbaden. In her keynote, Helga Zepp-LaRouche stressed that this would not be an academic seminar but rather a discussion about the fact that in this existential crisis of mankind, shown by the refugee crisis, the wars and the financial crash, solutions are within reach and must be realized now. In the wake of the terror attacks in Brussels yesterday, it is more than appropriate to recall former U.S. Senator Bob Graham's statement of mid-November last year after the terror attacks in Paris then, that had the classified 28 pages of the Joint Congressional Inquiry into 9/11 been made public, such atrocities could and would have been prevented. It's time to stop throwing good money after bad. The eroding political and security dominion of the government of Afghanistan has once again raised the potential of increased U.S. military and civilian assistance. President Obama made the complete withdrawal of U.S. military forces by the end of 2016 a central premise of his policy toward Afghanistan, but on the advice of his military and civilian staffs, he has modified that target. The new one is 9,800 troops through most of 2016, and 5,500 by the effective conclusion of his term. Moreover, he curbed the mission of these remaining troops to training and assisting the Afghan National Defense and Security Forces (ANDSF) and to counterterrorism. However, the Pentagon’s fourth-quarter assessment of security in Afghanistannoted that “[through] the second half of 2015, the overall security situation in Afghanistan deteriorated with an increase in effective insurgent attacks and higher [ANDSF] and Taliban casualties.” Indeed, the September collapse of the ANDSF and the civilian government in Kunduz, previously safely in government hands, and its stunning (if only temporary) capture by the Taliban, shocked Kabul to the core. Retaking it became the government’s highest priority, and the city proper was recaptured in a concerted military effort days later, although the surrounding provincial countryside remains contested. Similarly, Badakhshan province, also securely in government hands a few years ago, is now also contested. So, too, are Faryab and Uruzgan. Helmand Province, the traditional home of the Taliban, has been almost entirely lost; only three of its fourteen districts remain under government control, at best, and its provincial capital is surrounded. Likewise Kandahar, the Taliban’s “capital,” remains (optimistically) disputed. Meanwhile, over 1,800 Afghan soldiers and police were killed in the first third of 2015 and another 3,400 were wounded, almost 66 percent more than the previous year. Most troublingly, out of near desperation, the government is turning for security to the same marauding warlords and private militias it pledged previously to crush. The insurgency is now also divided between the Taliban and Daesh, that is, Islamic State. The Taliban are now, unexpectedly, the relative moderates, but they have had their own internal splits since the death of Mullah Muhammad Omar. Although Daesh has enjoyed only limited inroads so far, it has considerable momentum, much of it at the Taliban’s expense. More importantly, perhaps, Daesh redefines an insurgency pole pulling the Taliban in more fundamentalist and rejectionist directions, and probably narrowing the limits for any negotiated settlement to which the Taliban can agree and commit. The chaos following an attack would be global. Just in time for the annual appearance of cherry blossoms, fifty-two heads of state will come to Washington to discuss nuclear security. The fourth and finalNuclear Security Summit, launched by President Barack Obama in 2010, will take stock of the progress made in securing vulnerable nuclear material over the last six years. Thanks to the summit process, nuclear security, which was previously relegated to small groups of mainly Western bureaucrats and nuclear nerds, has become a prominent issue on the international stage. Major media outlets cover it, governments around the world have been forced to learn about it and greater understanding exists of why protecting nuclear material is critical to international security. Despite the buzz that these regular meetings of heads of states have generated, many states around the world and their citizens still do not consider nuclear security a relevant concern. The message the Nuclear Security Summit is promoting—that nuclear or high-risk radiological material might end up in the wrong hands and used in a bomb—just doesn’t resonate. Many in non-Western countries simply think the threat of nuclear terrorism does not apply to them. They see nuclear security as a preoccupation of advanced Western countries that consider themselves potential targets of nuclear terrorism. Semantics matters, and how we talk about the risks of nuclear terrorism contributes to these perceptions. The discourse on nuclear security focuses disproportionately on the West. For example, whenever those who care about nuclear security make their argument, they usually say something like: “Imagine a nuclear bomb detonating in Manhattan, London or Paris…” Common threat scenarios involve Western targets, and therefore make the problem seem like a Western one. Further, divergent views on nuclear security are undergirded by tensions in the broader nuclear realm. Many countries without nuclear weapons or military nuclear materials are reluctant to embrace the idea that the nuclear security regime needs strengthening. States with nuclear weapons have prevented the Nuclear Security Summit from addressing the security of nuclear material in military stockpiles, which constitutes more than 80 percent of all global stockpiles of fissile material. “For Whom the Bell Tolls” was my favorite novel, and its hero, Robert Jordan, my literary idol. Like him, Delmer Berg fought in Spain, for love. AN interesting obituary appeared in The New York Times recently, though the death of its subject last month was largely unnoticed beyond his family and friends. That’s not surprising. Delmer Berg wasn’t a celebrity. He wasn’t someone with great wealth or influence. He had never held public office. He was a Californian. He worked as a farmhand and stonemason. He did some union organizing. He was vice president of his local N.A.A.C.P. chapter. He protested against the Vietnam War and nuclear weapons. He joined the United States Communist Party in 1943, and, according to The Times, he remained an “unreconstructed Communist” for the rest of his life. He was 100. He was also the last known living veteran of the Abraham Lincoln Brigade. Not many Americans younger than 70 know much about the Lincoln Brigade. It became the designation given to the nearly 3,000 mostly American volunteers who fought in the Spanish Civil War in 1937 and 1938. They fought on the Republican side, in defense of the democratically elected leftist government of Spain, and against the Nationalists, the military rebels led by Gen. Francisco Franco. The Nationalists claimed their cause was anti-Communism and the restoration of the monarchy, and the Republicans professed to fight for the preservation of democracy. Fascists led the former, while Communists, both the cynical and naïve varieties, sought control of the latter. And into the Republican camp came idealistic freedom fighters from abroad. The Lincoln Brigade was originally called a battalion, one of several volunteer units that were part of the International Brigades, the name given the tens of thousands of foreign volunteers who came from dozens of countries, and were organized and largely led by the Comintern, the international Communist organization controlled by the Soviets. Franco’s Nationalists were supported by Nazi Germany and Mussolini’s Italy. Pakistan has neither the strong state machinery of North Korea nor the middle class revolution of Iran, thereby making Islamabad less easy to control. Even Pakistan’s army has started to lose its cadre to radical Islamist propaganda, thereby increasing chances of defection among soldiers. Pakistan is ridden with radical groups, engaged in mutual one-upmanship, and the entry of ISIS affiliates has only worsened the instability. News around global nuclear proliferation in recent days has largely surrounded North Korea, whose nuclear missile tests horrified the international community earlier this year. But a recent report by the Harvard Kennedy School says that there is in fact a far graver threat to the world than North Korea or Iran. “Overall, the risk of nuclear theft in Pakistan appears to be high,” the Kennedy School report said, under the title ‘Preventing Nuclear Terrorism: Continuous Improvement or Dangerous Decline?’ The report blamed Pakistan’s recent shifts toward tactical nuclear weapons for the heightened threat of nuclear theft. Pakistan’s nuclear arsenal does, in fact, deserve greater global attention than North Korea’s – or Iran’s non-existent one. Neither North Korea nor Iran face the dangers that challenge the security of Pakistan’s nuclear installments. For all of Kim Jong-un’s recurrent antics, North Korea is still a strong, centralized state, with no threats posed to the dictator’s hold on power – or his control over the country’s nuclear arsenal. In Iran, an increasingly vocal middle class, led by President Hassan Rouhani, has begun to ensure that Tehran is unlikely to turn trigger-happy any time soon, least of all once the economy begins to integrate itself with the rest of the world. But none of this is true in the case of Pakistan. Pakistan’s state machinery has been weakened significantly over time, owing to the prolonged battle for power between the civilian government and the military establishment. Prime Minister Nawaz Sharif’s control over his country’s nuclear arsenal is highly debatable. Buteven the Pakistani army is not quite as strong an institution as many would think. A Gallup survey conducted earlier this year reveals that Americans still consider international terrorism the top threat to their nation. A total of 79 percent of respondents indentified international terrorism as a critical threat, with Iran's nuclear weapons program in second place despite last year's deal. Interestingly, a new and more modern threat appears in third place. This was the first year where Gallup asked people about the threat from cyberterrorism and 73 percent of them considered it a critical threat. This chart shows the most critical threats to the US over the next decade, as cited by US adults in 2016. The Arab Gulf is characterized by regimes that blend church and state in their foreign policy. Saudi Arabia hosts Islam’s two holiest sites, and its ruling family’s power stems from a bargain its forefathers made with a fundamentalist Sunni religious sect. Iran is the world’s largest Shia state and has backed Shia groups throughout the region since the Iranian Revolution in 1979. Both states have been irresponsible in their tactical and strategic use of Islam in order to further their own foreign policies and to boost domestic political support. But in between these regional behemoths lies the United Arab Emirates, a small state that is rich in oil and gas. Since gaining independence from the United Kingdom in 1971, the UAE has emerged as an influential actor in the Middle East, one less interested in sectarian geopolitics. Instead, the UAE often supports nationalist groups and strives to enforce a Jeffersonian separation between institutionalized religion and politics, both domestically and abroad. What was once purely a strategic action has become a tactical move meant to help hold territory. In October 2015, two suicide bombers killed more than 100 people outside a railway station in the Turkish capital of Ankara. It was the deadliest terrorist attack in the country’s modern history, but it was also something more, something not fully appreciated at the time, according to Robert Pape, a terrorism expert at the University of Chicago: The U.S.-led military campaign against the Islamic State—a mixture of air strikes and support for local ground forces—had turned ISISinto a “cornered animal.” And the animal was lashing out. The group’s suicide attacks in its sanctuaries of Syria and Iraq declined, displaced by complex acts of terrorism abroad: the Ankara attacks, followed by the October 2015 downing of a Russian plane over Egypt, the November 2015 Paris attacks,more explosions in Turkey, and most recently triple bombings, at least two of them suicide blasts, in Brussels. All have appeared meticulously designed to kill as many people as possible in countries that are all, to differing degrees, fighting the Islamic State. The question is: Why is the animal suddenly flailing about? Why are bombs going off in Brussels now? On display in Belgium this week, Pape argues, is what he calls the “strategic logic of suicide terrorism.” Deciphering the logic of terrorists is maddeningly difficult, which is why the study of terrorism is anexercise in competing theories, all circling The Truth at varying distances. Pape’s theory is that suicide terrorism is fundamentally a response to military intervention—in the form of a rival occupying territory that the terrorists prize. For “nationalist” reasons, the terrorists want to control that territory, as any state would, through a monopoly on force and exclusive political authority. The argument here isn’t that all territorial occupations produce suicide terrorism, or that every individual terrorist is chiefly concerned with contested land, but rather that terrorist groups that today practice suicide terrorism tend to be grappling with dynamic losses of territory. Drawing on a database of suicide attacks around the world since 1982, Pape claims that his geopolitical paradigm has more predictive power than, say, explanations for terrorism that focus on religious fanaticism. The idea that ISIS is primarily driven by extreme Islamist ideology suggests that “the targeting logic of a group comes right from its [religious] doctrine,” Pape told me. “Given thatISIS’s doctrine has not changed—that is, it’s still a religious group—then there should never have been a shift of its targeting tactics.” And yet a shift in who it targets seems to have occurred. Why? In Pape’s view, ISIS has trained its sights on countries like Belgium, France, Russia, and Turkey because the U.S.coalition’s air and ground campaign, along with military operations by Russia and its ally, Syrian President Bashar al-Assad, have significantly eroded ISIS territory in Syria and Iraq in recent months (Belgium has participated in air strikes against ISIS in Iraq, but not Syria). According to one recent estimate by IHS Jane’s 360, the Islamic State lost control of 14 percent of its territory between January and mid-December 2015, and an additional 8 percent in the last three months (in the map below, red represents losses, green gains, gray no change). For much of its history, Brussels was occupied by oppressive empires: the Spanish Habsburgs in the sixteenth and seventeenth centuries, Austria in the eighteenth century (after France’s Louis XIV had laid waste to the city in 1695), and France from 1795 until 1815, after which it became part of the Netherlands. Belgium became an independent kingdom only in 1830 (under King Leopold of Saxe-Coburg and Gotha, a German, of course), after a combined rebellion of French-speaking socialists and Flemish Catholics against the Protestant Dutch king. Apart from their hatred of the Dutch, these groups had very little in common; they still don’t. Five years ago, Belgium established a peculiar record in being the only democracy to go without an elected government for more than a year (589 days, to be exact). The Francophone parties couldn’t come to an agreement with the Flemish to form a national government. But this was, as it were, in character. For the Belgian identity always was rather shaky. People felt an allegiance to their language community, to their region, to their church, or to political patrons—socialists in industrial and now rusting postindustrial Wallonia, and liberals, Christian Democrats, or Flemish nationalists in the north. Even imperial conquest was not always a strictly national enterprise: in the nineteenth century, the Congo belonged to King Leopold II alone. In the near future, Ukraine plans to conduct test launches of domestically produced ballistic missiles built without the involvement of foreign companies, said National Security and Defense Council Secretary Oleksandr Turchinov in an interview with Interfax-Ukraine news agency.According to Turchinov, resuscitating the domestic missile industry is a priority for Ukrainian authorities. "We need to develop as a space-faring nation, producing high-tech spacecraft, but we also need to restore the necessary production line of combat missiles that will protect the country," added the secretary. "We will soon carry out test launches of missiles of indigenous production, created by exclusively Ukrainian enterprises." Turchinov noted that the domestic rocket industry has struggled since the loss of close cooperation with Russian enterprises after 2014. Turchinov would not specify the missile types, citing the interests of strategic partners, but he stressed that Ukraine has strengthened its defense without violating any of its international obligations. 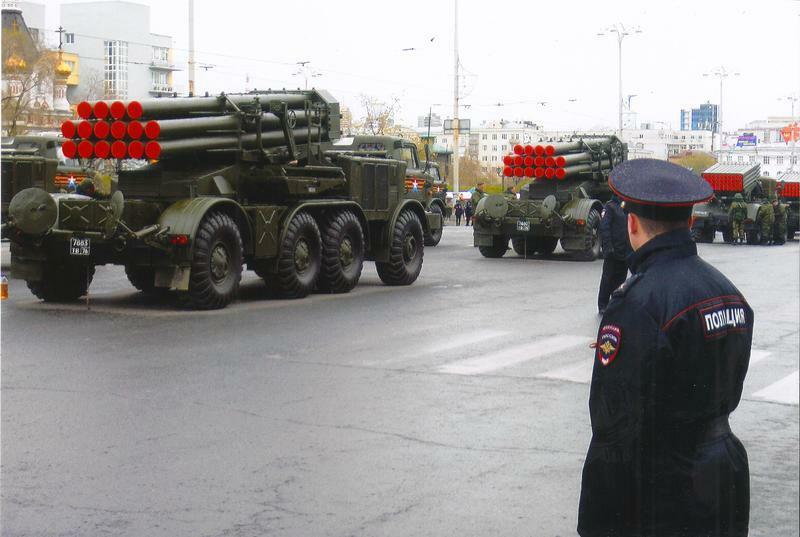 This development follows plans laid out in 2014 by the newly elected pro-Western Ukrainian President Poroshenko -- his "Strategy 2020" plan called for major overhaul of the nation's armed forces, a plan that involved increasing domestic development of the armaments industry and decreasing reliance on certain exporters, such as Russia, which drove domestic military production without leaving much for Ukrainian forces. In Soviet times, Ukraine produced numerous rockets, satellites, and missiles, most notably at its Yuzhmash factory, which Kiev inherited after 1991 and which sold much of its production line to Moscow until Russia's actions in Crimea and Eastern Ukraine. Meanwhile, the Russian Defense Ministry is once again considering reviving a century-old military concept - the use of armored trains. Last year, Russian Defense Minister Sergei Shoigu decided to overturn an order by his predecessor, Anatoly Serdyukov, to eliminate the four armored trains still in country's service. During Russian military operations in the North Caucasus and Chechnya from 2002 to 2009, the Russian military created an entire group of armored trains. However, once military operations in Chechnya wound down, the Defense Ministry has decided that a modern army no longer needed such trains. According to Russian daily Izvestia, the decision to save these special armored trains was made personally by Minister Shoigu. When Serdyukov unexpectedly resigned in late 2012, many of his orders on the reorganization of various units of the Ministry of Defense were not fulfilled, explains Izvestia. After Shoigu audited all military assets, he overruled his predecessor's orders on the reduction of military educational institutions, refused to disband mobile and airborne units, and decided to keep armored trains in the nation's Southern Military District. "When he was the head of the Emergencies Ministry (the Russian equivalent of FEMA), Shoigu, while in Chechnya during the counter-terrorist operation, saw these special trains working and found them useful for the Armed Forces," Izvestia explains. According to Russian security firm Group-IB, a cyber criminal gang stole $25.7 million (£17.8 million) from Russian banks in 13 attacks conducted between August 2015 and February 2016. Buhtrap – as the gang has been called by Group-IB – used spear phishing emails to send infected Word documents to financial institutions. When opened, these documents downloaded malware that ultimately enabled the attackers to create fraudulent transfer orders so that the bank would unknowingly send money to accounts that the criminals controlled. Banks aren’t the only institutions that are susceptible to phishing attacks. Whatever your line of business, phishing is a threat you need to take seriously: if one of your employees mistakenly opens a phishing email, your entire corporate network could be put at risk. This is why it is so important to ensure that your staff understand the threat that phishing poses and can recognise phishing emails. Russia is one of the world’s largest hydrocarbon resource holders, producers, and exporters, but it is undergoing an uncertain economic and energy transition. An economic slowdown, the dual shocks of a sharp decline in oil prices and the imposition of finance and technology-oriented sanctions, shifting markets for Russia’s exports, and internal economic and political dynamics are spurring dramatic changes in Russia’s domestic and international oil and gas strategies. These changes, while not predetermined, will impact geopolitics, energy security, oil and gas investment, and global hydrocarbon market dynamics in the near to medium term. Given the sheer size of Russia’s hydrocarbon production, the importance of oil and gas revenue to the health of Russia’s economy, and Russia’s role as an exporter and provider of hydrocarbon infrastructure, this study fills a crucial gap by analyzing the evolution of Russia’s oil and gas sector and its anticipated realignment. Tatiana Mitrova is head of the Oil and Gas Department at the Energy Research Institute of the Russian Academy of Sciences (ERI RAS) in Moscow. Download PDF file of "Shifting Political Economy of Russian Oil and Gas"
Download PDF file of "The Power and Peril of Russian Oil and Gas"
SIGINT Signals Intelligence Antennas also collect a range of electromagnetic radiation, including cellphone conversations, text messages, two-way radio conversations, automated telemetry (for example: regularly transmitted diagnostic data on a fuel pipeline), Wi-Fi signals, and other forms of wireless data. This raw data goes to a processing facility, where systems decrypt (if necessary), analyze, and prepare a deliverable intelligence “product.” Not all SIGINT collectors look like flying cellphone towers; some, like the F-22 Raptor, have antennas embedded in their skin. MASINT Measurement and Signature Intelligence A senior military intelligence officer calls MASINT “the least known and understood, but arguably the most reliable form of intelligence, and one of the most important.” Some sensors detect uniquely identifying spatial and temporal intervals and timing patterns in electronic transmissions; others detect uniquely identifying chemical and elemental signatures of substances and materials; still others collect data that enable analysts to identify a target by the way it moves. 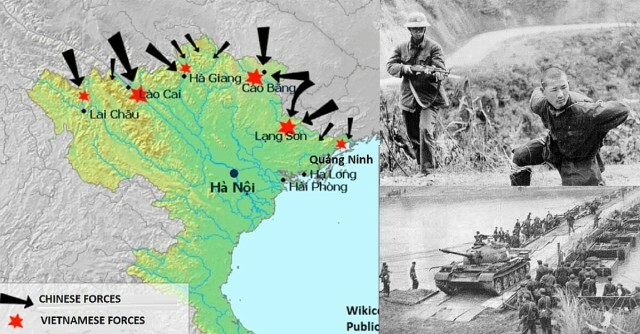 In 1979, China invaded Vietnam because Vietnam invaded Cambodia. 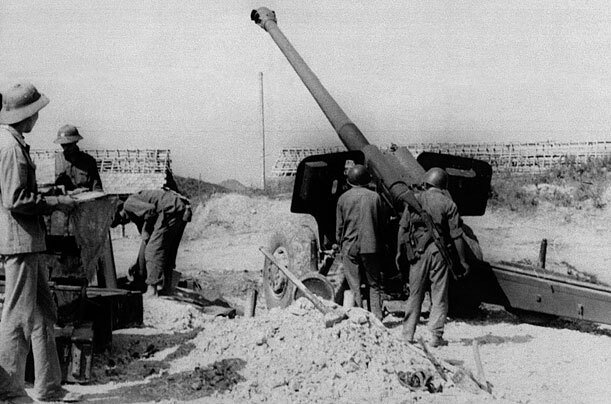 The conflict lasted a month, resulted in tens of thousands of casualties, and Chinese withdrawal from Vietnam. Despite this, China claimed a victory. The Soviets were exhausted from decades of war, so they wanted peace with the West. But Mao Zedong (China’s leader) wanted a more aggressive approach toward “decadent” capitalist nations, which is why he attacked Taiwan from 1954 to 1955, and again in 1958. The US went to the latter’s aid, but the Soviets didn’t want to get involved. This angered Mao. Then in 1959, the Soviets offered moral support to Tibetan rebelsafter the latter’s failed uprising against China. 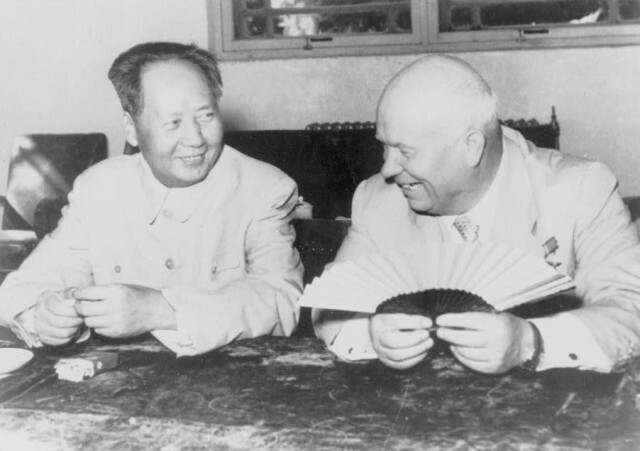 The following year, Mao and Soviet Premier Nikhita Kruschev were yelling at each other at the Romanian Communist Party Congress. Still, they needed each other, so they kept their alliance. At least till the Cuban Missile Crisis in 1962. With the world’s focus on Cuba, China invaded and occupied India’s Aksai-Chin province. And what did the Soviets do? They withdrew their missiles from Cuba and sold weapons to India. For Mao, that was the last straw. Soviet capitulation to the US was bad enough, but what kind of ally sells weapons to your enemies? Sino-Russian relations took a nose dive. By 1969, they were having skirmishes along their borders. Realizing he couldn’t confront the Soviets and the Americans at the same time, Mao began wooing the Americans. It worked. President Richard Nixon visited China in 1972 and reestablished diplomatic ties.